Gracie has always been a finicky eater. 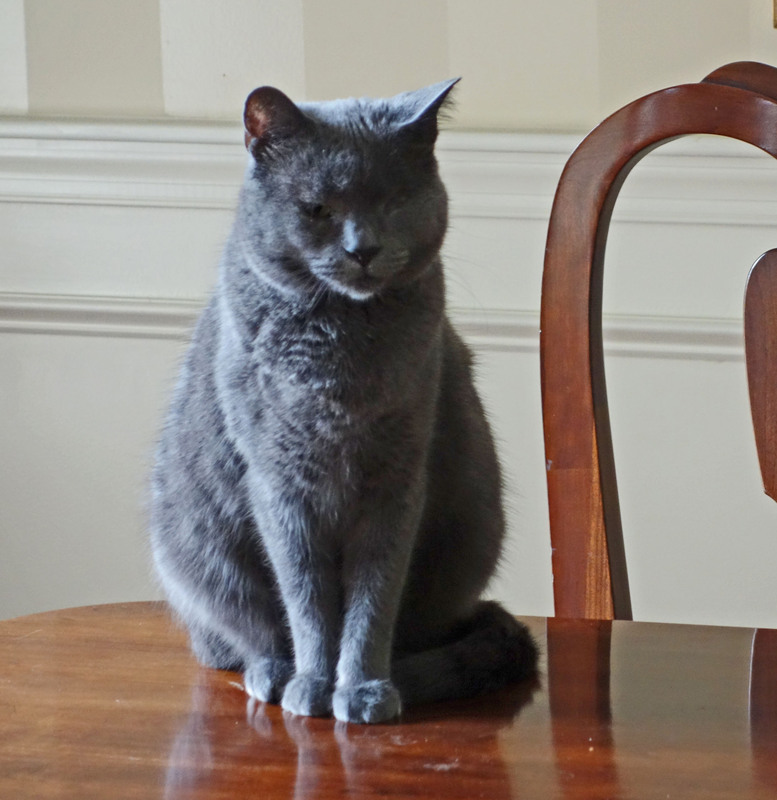 (What cat isn’t…except for Hoover cat Hazel?) The past two weeks have been a roller coaster ride. Yet again. She stopped eating wet cat food completely. Nothing suited her. I routinely carry six different flavors of various brands. Nada. She wasn’t having any of it. The vet prefers she eat wet. She gets crystals in her urine and she needs enough water. Cats do what they want. They are not into health decisions. They go by smell and what they are in the mood for. Eau de mousie! All is good here but next time I want a normal cat. Grateful would be good too. Is there such a thing? 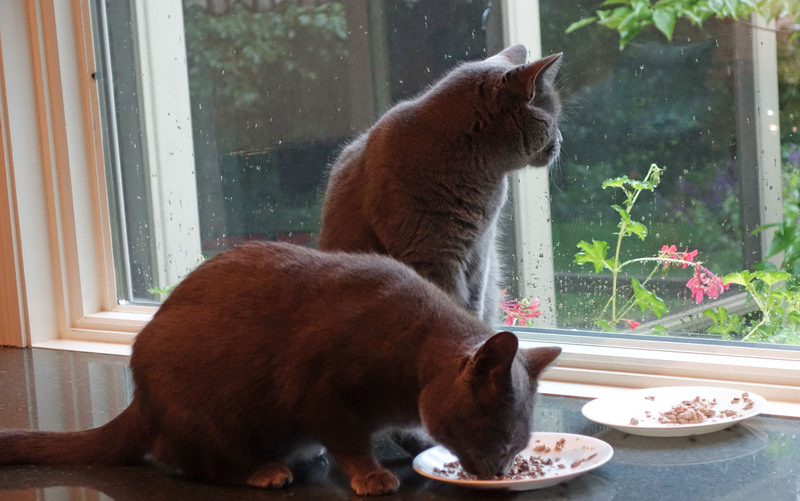 Here is Gracie (in front) noshing while Morgan looks out the window. This entry was posted in For Animal Lovers Only, Sassy cats and tagged animals, Cat food, cat's eating habits, cats, finicky cats, Gracie, Morgan, pets by Kate Crimmins. Bookmark the permalink. Kate, I am so happy Gracie started eating again. Always a worry when they won’t eat and a puzzle to find what they will eat. She’s going to the vet soon for shots so we’ll have the discussion but she’s a cat. As long as it’s not her teeth (and I don’t think it is) we’ll never know. Maybe the changing weather. They do what they are going to do – and there’s nothing you can do to stop that. You are an excellent cat parent – you take great care of them all! Good news is that she’s trying to make up for lost time…er, food. She had a second helping today. Same food she wouldn’t look at last week. No, I do not think there is ever a normal cat! I am glad she is eating again. It can be maddening when they turn their noses up at everything. Yes it is. Makes me feel likes something is wrong and I’m missing it. I think that next time you’d do well to get a written agreement from any cats coming into your home. They should be prepared to show gratitude and a great deal more cooperation. A paw print should do for a signature! I would be petless for sure! They drive a hard bargain when agreeing to come here. Ferals are much more grateful. She’s just messing with your head, Kate! I do like the idea of a grateful cat. That would be a weird breed! Annie needs extra fluids, too. She loves Libby’s 100% canned pumpkin. Leah was told about this a few years ago (I didn’t get Annie till a year ago this summer–she’s around 8-9 years old). I had no idea cats would eat pumpkin puree! I give her a heaping teaspoon either alongside her canned food or mix it in–probably every other day or so. Come to find out a few canned foods actually have pumpkin in them. Their other cat, Sammy, ate the pumpkin, too. Have you ever tried it? None of my cats will eat it. Nor will they eat yogurt, baby food or any of the wonderfully stinky food toppers they make. Hazel will eat a very little rice mixed in with her food but very little. Now the vet says that rice isn’t good for cats. Gracie is back to eating the regular cat food and since she didn’t lose any weight, I’m not worrying about it too much. It just makes me crazy. Many of us have a stink eye for when the word “healthy” is said. Good cat, you got there. Smart, in my estimation. The word healthy, especially when used with food or exercise, terrifies me! I like healthy naps and healthy happy hours. Ever since I got Boss Cat, she’s been on a diet. The vet recently recommended wet food. Boss Cat devoured it and gained weight. Usually wet cat food has less calories. My vet wants Hazel on wet completely although come to think of it, after the first few pounds she hasn’t lost anymore. Still chubby. She tells me it’s her bone structure! Gracie goes through fits. Right now she is eating wet cat food as if she was starved on an island for 2 weeks. Weirdo. I never paid attention to what our cats ate, either that or I’ve forgotten. I must have been a bad mother. As long as they survived. Cats usually make a scene if there isn’t enough or the right kind of food. I think our first cat lived to be 14 or so. We got him as a kitten. The other three were strays our children dragged home. They were with us quite a while, though we never knew their ages. 14 is a long time. The average life of a stray is 2 years to maybe 5. I never think of you as a pet person but that’s because you haven’t had one since I know you. We always had pets both when I was a kid and then I had them when I moved out. When I was a child we had a dog that lived to be 18. He mostly lived outside but he was a scrapper. Everyone loved him. John’s family had no pets. His dad was a pediatrician back in the day of house calls. A child needed a shot, and the parents assured him the dog was not in the room. Dr. M. jabbed the boy with the needle, crying ensued, and the dog under the bed bit the good doctor. The needle broke off under the skin, and the child had to be taken to the hospital to have it removed. In that household, you were not allowed to THINK of wanting a pet. We had been married for three years when John saw a sign for free kittens, and that’s when we brought Thor home. I came from a dog-owning family, so having a cat never entered my head. We enjoyed that first cat and the others that came later. I’m glad she’s eating again. I know how scary it can be when our pets won’t eat. It does feel like they’re punishing us because we worry so much. Hope Gracie stays eating. Have a nice weekend. She’s been barfing (really spitting) up too. At first I thought hairballs but the last few rounds didn’t any any hairballs, just spit. Overall though, she’s healthy. We don’t let her out so she just spits up wherever. We are grateful if we don’t step in it! Are her teeth ok, Kate? Yes as far as I know. No sensitivity like before. She goes for her annual in the next week. No! Not normal! You mean it doesn’t get any better than this? Oh, you would never want a normal cat (if there actually is such a thing). What would you write about?! I’m glad that Gracie is eating again! There are enough other stories. Morgan got another mouse last night. Morgan is the mouser. Gracie kills the feather on a stick. She does it with a lot of drama. Maybe he was swooped by a bird. My old cat Jake used to get attacked by birds all the time. It was because he also went after them and occasionally killed one. The mockingbirds were the worst. He was terrified of them. I suspect you may be right. He also has a strong dislike of cats, so would assume some bad experiences in his past. That’s true. Morgan is as close to perfect as they come. She got another mouse last night. We didn’t even know one came in. She gets them early, leaves them neatly dead at the bottom of the basement steps. It’s only missing a bow. Oh my! I am glad she is eating now and hopefully you won’t see her “stink eye” for awhile! Having a one-eyed cat give you the stink eye is funny! She does keep me warm. Morgan is agitating to get the fireplace going. It’s a big early but we had a frost last night so it’s soon. Just like with humans, there’s probably no such thing as a “normal” cat. I’m glad she’s doing better, Kate. Enjoy your weekend! I’m learning to manage my guilt. As I said, she didn’t lose an ounce so if she prefers kibble for a week or two, I’d rather she just said so. 🙂 Based on your antics I don’t think I could handle 2 weims.